Metals recovered in fire assaying are the metals that emerge from the fusion of the material in a assay furnace, for gold, usually at temperatures of about 2,000 Degrees F. The Fire Assay Method is centuries old, but it is still one of the most reliable methods for performing assays (to determine the metal content of a ore) of ores that contain precious (noble) metals - Gold, Silver and Platinum. Ore from the mine, or exploration sampling program is scientifically sampled using a statistically accurate method fitting the desired accuracy, it is then prepared by crushing, splitting and pulverizing. This is a process referred to as sample preparation. Since the original sample may be a hundred pounds or more, a scientific method of obtaining a representative sample for testing of usually 30 grams is used, and it includes reducing the ore to a predetermined particle size and then splitting the ore using a statistically accurate method, to obtain the 30 gram representative sample for fire assaying. For fire assaying ores, usually fluxes, materials such as borax, soda, silica are added to the ore. The amounts of each chemical added to the flux mixture depends upon the elements present in the particular ore, such as sulfur and iron. Usually lead, in the form of Litharge, is also added. The Fluxes (Except for the Lead, which is added for oxidization and sodium carbonate, which is added for de-sulfurization), are added for the purpose of lowering the melting point and imparting a homogeneous fluidity to the melted oxide impurities. The most common oxide impurities are silica, lime, and various metal oxides such as iron, copper, zinc, etc.. 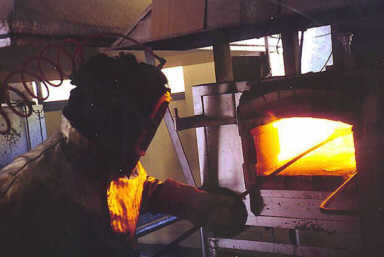 The ore samples with the fluxes are then added to a crucible, placed in a Assay Furnace, which has been pre-heated to 2,000 deg F, and left for a predetermined time, to melt or "fuse" the contents of the crucible. Then, the crucibles are removed from the assay furnace, the molten slag is carefully poured from the crucible, into a cast iron or graphite mold, such as cone shaped molds, and allowed to cool. The lead, containing the gold, being the heaviest material in the slag will be on the very bottom. 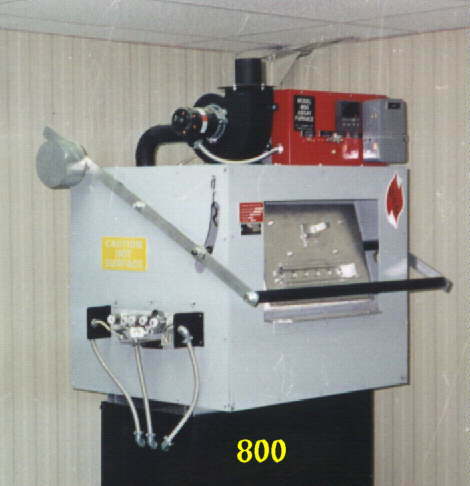 When the slag cools, the hardened slag is removed form the mold and tapped with a button hammer to break away the lighter material, leaving only the lead button. The lead button is placed in a clay crucible called a Cupel. The cupel is designed to absorb the lead when heated to the melting point, and they are rated in the grams of lead they will absorb. So, the cupel's with the lead buttons are again placed in a Assay or Cupellation furnace, heated to about 2,000 deg F and the lead is absorbed into the cupel, leaving only a tiny gold bead. The cupels are removed from the furnace, allowed to cool and the gold bead is weighed. The most common unit of fire assay samples is called the Assay Ton, which is 29.166 grams of ore. A milligram (0.001) gram of gold in a sample weighing 29.166 grams gives an assay equivalent to 1 troy ounce of gold in a ton (2,000 pound) of ore. A troy ounce is 1.097 ounces. Since mining companies need to know the content of salable material in their ore in usable numbers, such as ounces of gold per ton of ore, this makes conversion and reporting easy. So, the gold bead will usually weigh much less than 0.001 grams, more like 0.0001 grams. 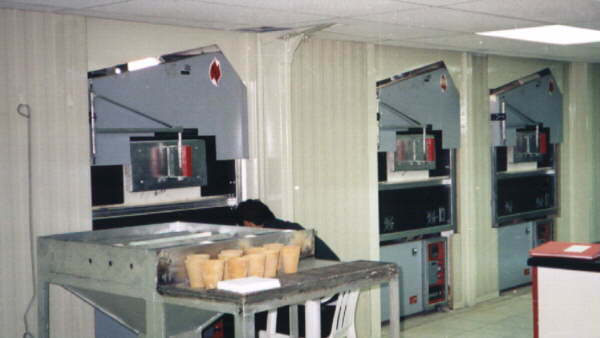 Accuracy in sampling, preparation, assaying, handling, weighing is extremely important in fire assaying, since errors will influence the 0.0001 g final gold bead in sometimes astronomical proportions, if done improperly, using un-scientific methods, and little attention paid to the assay process.